Improve customer satisfaction, reduce order times, and control costs. Since 1982 CAL Business Solutions has been providing ERP systems to small and mid-sized distributors. These solutions manage supply chain and logistics activities, including warehouse management, inventory management, and order management (sales and purchase orders), and connect these operations with financials and sales. CAL Business Solutions extends the power of Dynamics GP for the distribution industry with SalesPad. SalesPad adds functionality for workflow, order entry, inventory, and sales management, and makes it easier to get information out of Microsoft Dynamics GP. It can even lower the overall cost of a Dynamics GP implementation. Distributors can automate processes and reduce errors in purchasing, order fulfillment, inventory tracking, and customer support with distribution management software from Acumatica. It is fully integrated with Acumatica’s CRM, Manufacturing, Field Service, and Project Accounting for visibility across the entire organization. 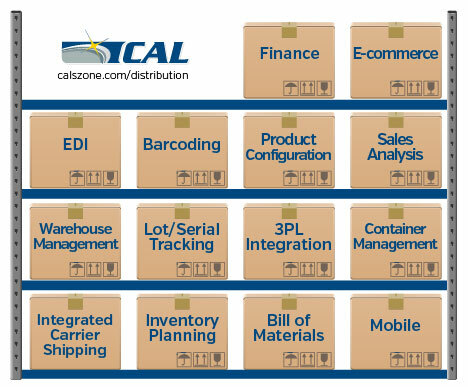 If you are a small or mid-sized distribution company looking for similar benefits, contact CAL Business Solutions. We can help you evaluate your current systems, business processes, and goals to determine the right solution for you. Crown Maple is on track to becoming the largest maple syrup distributor in North America and also offers education, entertainment and retail services. They realized early on that their QuickBooks accounting software could not keep up with their growth. They wanted a robust inventory system, integration to eliminate manual processes and spreadsheets, and flexible reporting that could easily be shared with their remote management team. For 10 years Thor, a Connecticut based multinational distributor of specialty chemicals, had been using Microsoft Dynamics® SL (Solomon). As the business grew they faced the choice of a major upgrade or a new ERP software package. Amax faced quite a challenge with finding and implementing an enterprise resource planning (ERP) system in fewer than six months. At the same time, Amax had to keep operations running, set up two new distribution centers and renegotiate a multiyear contract with one of its largest customers. The solution was found in Microsoft Dynamics GP with SalesPad, implemented by the CAL team. Beekley Medical has trusted Microsoft Dynamics GP (formerly Great Plains) as their core financial ERP system for more than a decade. Recently they decided to expand the capabilities to manage inventory and automate the manufacturing process. Each decision was focused on ways it could streamline processes in order to provide even higher levels of service to its customers. Moran USA LLC, a wholesale distribution company based North Haven, purchased Microsoft Dynamics GP but after two years it was still not functioning as promised. The Moran team was extremely frustrated and was considering scrapping the new system despite their substantial financial investment. As a last resort, Moran looked for a new Microsoft Dynamics GP Partner in their local area and started working with CAL Business Solutions. Now Moran USA now has a practical ERP system they are comfortable with, that helps them run their business better, requires minimal ongoing support and lower annual fees. Warner Specialty Products had a common problem: old, outdated software and the business processes, and bottlenecks to go with them. They set out to upgrade their Macola ERP system, but get more value for their software dollar. Using Microsoft Dynamics GP with SalesPad, they have improved time-to-customer, reduced overhead costs, and obtained a level of visibility on their order process that would have been impossible otherwise. For this small distribution company, the decision to implement the Microsoft Dynamics GP with Salespad means that they can serve their customers better now and as their business grows. Workflow keeps quotes from falling through the cracks. SalesPad gives more functionality for a lower software cost than a traditional GP system. Because Custom Bottle extended their existing Microsoft Dynamics GP application to the rest of the organization using SalesPad, they increased the amount of information employees know about customers and their orders. What Custom Bottle discovered is true for most companies: when employees who wouldn’t normally use the ERP system are given access through SalesPad, it positively effects sales, deepens the relationship with customers, and adds value that positively affects the bottom line. Easy to install with existing Microsoft Dynamics GP system. Detailed on time delivery reports leads to increased business with existing customers. As a growing company Genex recognized the limitations QuickBooks was putting on their business. Their new Microsoft Dynamics GP with SalesPad system gives them the tools they need to work more efficiently now, and take them to the next level of company expansion. Kloter Farms sought a revamped IT infrastructure that would allow the family owned company to realize its vision of improved management information, streamlined business processes and reduced costs. Kloter Farms called on CAL Business Solutions Inc. to help improve operations by implementing a Microsoft Dynamics GP accounting system and pulling together the resources to integrate several disparate systems including a GoldMine front office system. As a result of CAL’s work, Kloter Farms is realizing its technology vision, has steadily increased its sales and is poised for continued growth. Read the full case study: Retail Distribution Company Uses Microsoft Dynamics GP to Manage Growth, Increase Sales and Simplify Maintenance. If you are a distribution company that is evaluating new software, contact CAL Business Solutions to determine if Microsoft Dynamics GP is the right ERP system for your needs.